We are just 1 week away from our adults only 80's Night Fundraiser! 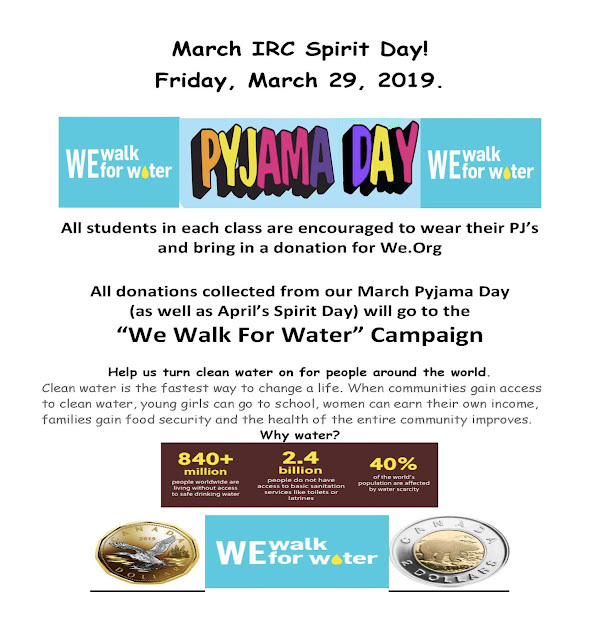 All proceeds from this event go to directly to IRC Parent Council funding initiatives like upgrading the library, Scientists in the School, upgrading gym equipment and so much MORE! Dressing up is not mandatory, but totally encouraged! 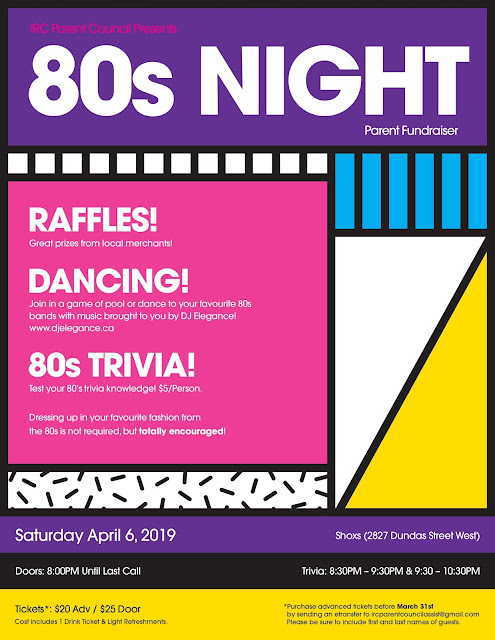 You won't want to miss your favorite 80's tunes brought to you by IRC parent and DJ Benjamin De Graaf akaDJelegance https://www.djelegance.ca/ Bring your dancing shoes and get ready to party! Are you a Trivia wizard? Then you are totally going to want to bring your smartphone and test your 80's Trivia knowledge! ($5 additional fee to play). There are pool tables available so you can challenge a friend to a game or two! Raffles! Donations from local merchants include gift baskets, alcohol and restaurant gift certificates from Nodo, Kelsey's and more! 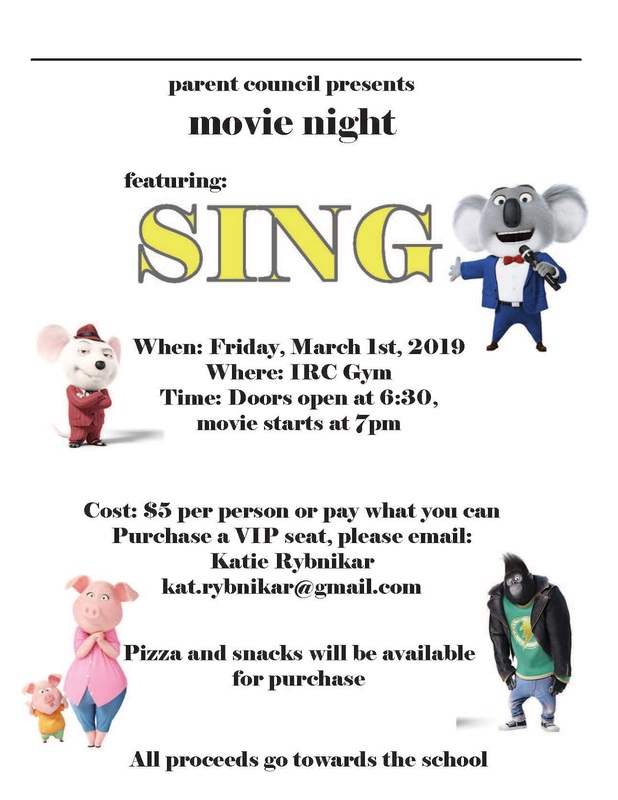 Our second Movie Night is next week! Join us Friday, March 1st at 7:00 pm. Doors open at 6:30. We are showing the animated film SING. $5 suggested admission, or pay-what-you-can. Pizza, popcorn and treats will be sold. VIP seating is available at an additional $5. Volunteers are still needed to run this event - we can't do it without you! To reserve VIP seating or to offer to help out, please email Katie at kat.rybnikar@gmail.com. Proceeds from Movie Night fund important parent council initiatives that enhance our children's experiences at IRC. Lift Up Your Library Fundraiser! The Parent Council Equity Committee would like to thank everyone for their support of the Lift Up Your Library fundraiser and the book fair on February 14th. The book fair raised over $1000! The fundraiser continues until March 21st both online (https://anotherstory.ca/?q=h.tviewer&e_def_id=EhuZE8YdnjI) and in person at Another Story Bookshop, located at 315 Roncesvalles Avenue. You'll get 20% off all purchases made for the library. Another Story has a phenomenal collection of children's, young adult and adult books so if you happen to make some purchases for your home collection, they will convert 20% of those sales into a store credit for the IRC library! 1. From the main page select "Make a Donation"
2. 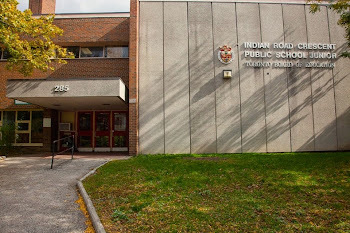 Select Indian Road Crescent Junior Public School from the "Fund Destination" drop down bar. 3. Please mention "Library" in the messages. We're hoping to raise $5000 for our school library and so far we've raised just over $1500! Let's try to reach that goal by March 21st to expand and update the selection of books available to our kids! If you have any questions please contact Kara Stewart-Agostino at kandragostino@gmail.com. Regretfully, the Fundraising Committee has to cancel's tomorrow's Valentine's Day Bake Sale at parent-teacher interviews (Thurs, Feb 14th) due to a lack of volunteers or offers of baked good donations. PARENT COUNCIL UPDATES - BAKE SALE, MOVIE NIGHT, 80s NIGHT & MORE! Our next Parent Council meeting is Tuesday, February 12, 7:00 pm to 8:30 pm in the IRC library. We will circulate the agenda prior to the meeting. We hope you can join us! The Arts Committee has a new Liaison - Maite Feeney! Please reach out to Maite if you would like to participate in this important committee. Everyone is welcome! Email: maite.feeney@gmail.com. Ms Khokhar, the IRC librarian, has a created a $4,500 wish list to expand and update the IRC library. The Parent Council Equity Committee has partnered with Another Story Bookshop to create a book registry for our school library. Help us Lift Up the Library by purchasing a book at Another Story Bookshop. #1 on February 14th at the book fair in the front entrance of the school. #2 Visit the store in person at 315 Roncesvalles Avenue and ask about the IRC book registry. Please share this with relatives who might be looking for ways to help your kids’ school. December Parent Council Meeting Minutes can be downloaded here. Latest financial statement can be downloaded here. And the Teacher Report and Classroom updates can be found here!